Thank you for visiting our website. As an up-to-date business, we want to give you the opportunity to stay in touch with our company. D & D Auto Transport is not a transportation broker. We have been operating our own fleet of auto transports since 1984. 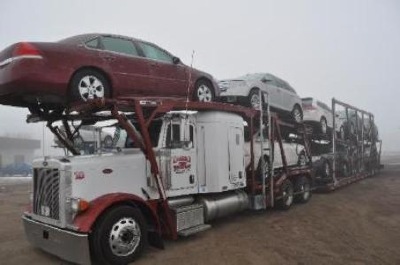 We can haul 8-10 vehicles, depending on the vehicle size, at one time. D & D is fully licensed and insured. We offer competitive rates and an outstanding record of satisfaction among our valued customers. This includes individuals, dealerships, and auctions. Although we are licensed in 48 States, we specialize in servicing the Midwest to the Southwest. When you call D & D you will reach a real person, not a prerecorded message. You will be explained how the transportation process works and we will gladly answer any questions that you may have. We are committed to making your car shipping experience pleasant, easy and hassle free. If you are not familiar with our company and your first contact with us is online: We would be pleased to hear from you! Please let us know what your needs and questions are, we will be more than happy to help. We can be reached by calling toll free 1-800-657-2144. In brief, you should know the following about us: our company has been in business for over 25 years and has been responsible for providing outstanding customer service ever since. Our specialty is in the area automobile transportation. Our regular customers particularly value that we provide personal service. Our business is located in Silver Creek, Nebraska.